“Shakespeare and Others: . .” What Can We Learn from the Shakespeare Apocrypha? Orthodox scholars do talk about the authorship question, but there are rules. First and foremost: NEVER question the orthodoxy. That is, inquire as much as you like, but do not question the belief that “The Canon” was by and large written by the Shakspere from Stratford. Due in part to the growing pressure from outside the academy, things have opened up a little and lately it’s been allowed for scholars to talk about “collaboration”, as long as the genius emanates solely from the orthodox . 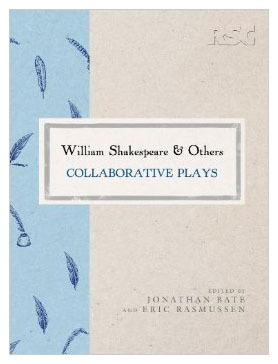 That’s sort of what’s happening with “William Shakespeare & Others, Collaborative Plays” edited by Jonathan Bate and Eric Rasmussen. It is a handsome work published by MacMillan in coordination with the Royal Shakespeare Company. Called a supplement to the complete works the two edited a few years ago, it claims to be “ . . . the first edition in over 100 years of the fascinatingly varied body of plays that has become known as ‘The Shakespeare Apocrypha’.” It includes modernized texts of 10 plays that have been associated with Shakespeare, but are not a part of what we know as “The Canon.” Each play is accompanied by introductions, commentaries and an appendix of fascinating interviews with actors and directors. The Apocrypha is a group of a dozen or so (depending whose counting) generally inferior plays (and some poems) that were either published under the name or initials of William Shakespeare, or for one reason or another, attributed in part to his hand. 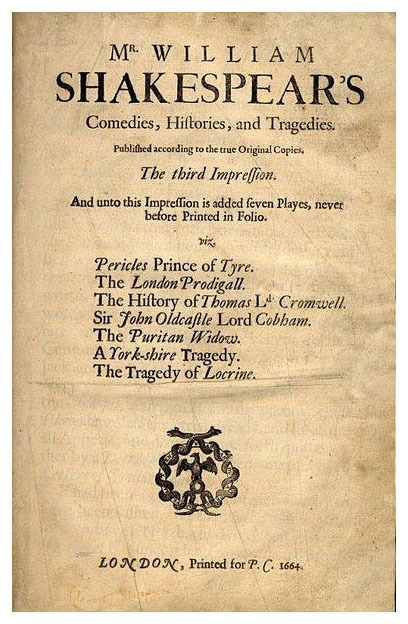 None of the Apocrypha appear in the 1623 First Folio. “The book does popularize one of the most interesting developments in the past 30 years of Shakespeare scholarship,” says Shakespeare scholar Gary Taylor in a review he wrote in the Washington Post (see link below). “We have always known that, like television and film today, the early modern entertainment industry often worked from co-written scripts. The explosive growth of computer databases, combined with new forensic technologies, has revolutionized our ability to identify empirically, with high levels of probability, who wrote what. Digital humanist Hugh Craig, in his essay on “Authorship” in the 2011 “Oxford Handbook of Shakespeare,” summarizes the emergent consensus that Shakespeare was part-author of as many as 15 plays, including 10 already printed in the RSC’s “Complete Works” and many other modern editions.” Indeed, it now seems that instead of the solitary genius of earlier generations, today we have Shakespeare, the great TV writer. Taylor does a good job in his review of “unpacking” some of the ideas that Bate and Rasmussen attempt to demonstrate in their book. It is interesting to note that he admires the comments by actors and directors more than those made by scholars. It is very much worth reading. It seems odd, but since no one really knows much about William Shakespeare (no manuscripts survive, no letters, no first-hand evidence that he was even a writer), license has been given for a rather abundant speculation on the life and letters. As longtime Roundtable member and authorship scholar Sabrina Feldman has pointed out, there is not another prominent figure in the annals of English literature who has been credited in his lifetime and for decades after with writing two distinctly different sets of literary works, the first being works of peerless genius which are called The Canon, and the second more or less inferior works which have come to be known as Apocryphal. My very entrails burn for want of drink. My bowels cry, Humber give us some meat. This fruitless soil, this ground, brings forth no meat. The gods, hard hearted gods, yield me no meat. One can see why no serious-minded reader is willing to associate the revered William Shakespeare with lines such as these. But wait. Which brings me once again to Dr. Sabrina Feldman. In addition to being a longtime member of the Roundtable and a genuine rocket scientist at Cal Tech, Sabrina is also one of the most original thinkers and researchers on the authorship question, especially authorship and The Apocrypha. 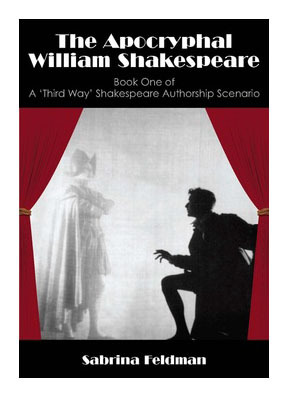 Last year she published her remarkable book, “The Apocryphal William Shakespeare, Book One of A ‘Third Way’ Shakespeare Authorship Scenario”. In her book Sabrina turns on its head the idea that Shakespeare could not have written the inferior works contained in the Apocrypha. On the contrary, she suggests that those shoddy works (though often quite risqué and amusing) may be the ONLY things written by William Shakespeare of Stratford. Her point is this: Since we have no direct evidence (nothing in his own hand) of William Shakespeare ever having written anything except a very awkward last will and testament, and since the biographical evidence suggests that William Shakespeare was more a semi-literate business man than the greatest poet who has ever lived, perhaps it was the theater owner/land speculator that wrote the clumsy work and the genius of the Canon was created by . . . well, you have to read her book. OR come to our next meeting on February 8th. With her meticulous evidence and scientific thinking Sabrina will give us a preview of “Book Two”; her theory about who the most likely candidate might be, and it isn’t Marlowe, Oxford or even Mary Sidney. The huge surge in interest over the last decade in the authorship question has many reasons, but one of the most fundamental enigmas is the seeming discrepancy between what we know about the biographical facts of the Shakespeare from Stratford and the sheer number and brilliance of the plays themselves. It’s not to say that a successful theater and landowner/speculator could not have written the world’s finest dramatic works, but it just seems odd. It seems worth inquiring about. But for the orthodox scholar, the matter is settled. No room for doubt. That rather arrogant, academic resistance to inquiry is what has riled a lot of us and compelled is to press for better answers than the ones we have been given. As Sabrina has so brilliantly demonstrated in her research and Bate and Rasmussen (staunch Stratfordians both) in their handsome new supplement , the Apocrypha may represent a fruitful path to follow toward acquiring those answers. A final note: For Bate and Rasmussen to omit from their commentary the original work done by Ms Feldman speaks directly to the myopia of current orthodox scholarship; and shows an inability on their part to think in any way other than the ordinary and pre-conceived.